A tumultuous force diagonally crosses the unusual still life seen here. 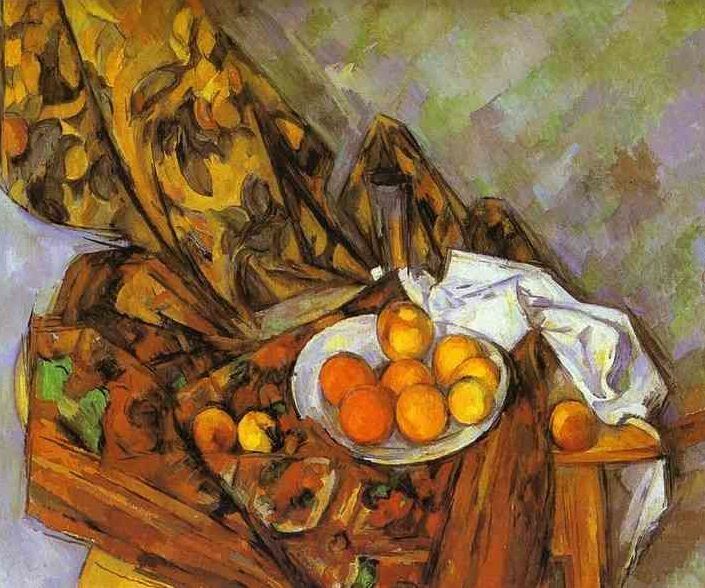 Before Cezanne no one had dared such vehemence for static and familiar objects arranged on a table. The colored drapery seems to have been distorted by some uncontrollable vital energy. Something organic, linked to the pulsations of nature, underlies the dynamic quality of the composition. Pissarro, writing about the retrospective exhibition which Vollard held of Cezanne's paintings, said, "The collectors are stupefied. They don't understand anything about it, nevertheless he is a first-rate painter of astonishing subtlety, truth, and classicism. . . . My enthusiasm is nothing compared to Renoir's. Even Degas has succumbed to the charm of this refined savage. Could we be wrong? I don't believe so... As Renoir said to me quite rightly, there is an indefinable something analogous to the Pompeii things, so crude and wonderful. . . . Degas and Monet bought some marvelous things. As for myself, I exchanged a few splendid Bathers and a portrait of Cezanne for a bad sketch of Louveciennes." Recognized by his equals, Cezanne could at last begin to reassure himself. Three years before his death he wrote to Vollard, "I am obstinately working; I am catching a glimpse of the Promised Land. Will I be like the High Priest of the Hebrews or shall I be allowed to enter. ... I have made some progress. Why so late and with such difficulty? In fact, is art not a priesthood which requires pure souls who belong to it entirely?"